The moment I heard about it, I put Want on my to-read list because, um hello, sci-fi thriller set in Taipei? Yes, please. I’m over the moon this book is out in the world now, and we at Rich in Color will be talking more about Want in August! More on that next week. Today, we welcome Cindy Pon (@cindypon) to Rich in Color to talk about Want, writing, and representation. Check it out! First off, I have to say that I was beyond excited for Want, a YA set in Taipei, Taiwan! I’ve been there! Ahhh! Ahem, anyway… How did it feel, writing a book set somewhere that’s clearly personal for you? Not to mention in an all-too-plausible near future setting that feels very relevant to current events right now? All my novels are special to me, but WANT especially because it was an ode to my birth city. I really wanted to bring the city alive for readers, I wanted Taipei to be a character in itself. From some reader reactions, I feel like I achieved that for them, and it makes me so happy! As for relevancy, WANT is the novel that took longest from fruition in 2011 to actual publication. Six years is a LONG time, and I began to worry my near-future thriller would be retro-thriller soon enough. ha! Often the reader reactions were that the world felt very believable and real, and that is because I pulled a lot directly from headlines. One thing I found fascinating was the seamless switching between languages in Want. Different books usually handle this in different ways to varying degrees of success. How did you decide you were going to handle the issue of portraying different languages? Hmm. It had to make sense but also feel organic and not confusing? I had great beta readers and critique partners, and I relied on them to make comments on points of confusion. I admit I’m a very intuitive writer, so it’s just a matter of does this fit, does it flow, does it make sense? Especially as I’m revising. I definitely ship Zhou and Daiyu. But another relationship that felt incredibly central to Want was family – the found family of Lingyi, Iris, Victor, Arun, and Zhou. What made you choose this particular cast of characters? Originally, WANT began as a short story in Diverse Energies (Tu Books) and only featured Zhou and Daiyu. I found both of them utterly fascinating, and it was their dynamic and my curiosity over what their stories were that convinced me to flesh the short story into novel length. As for the squad, I wish I could tell you I did tons of brainstorming and character notecards and trawled through countless images online for inspiration, but as with so much of my writing, they just happened. I did know that I needed distinct characters with distinct traits and abilities to offer to the group. That was the first and easiest thing to decide. Then, they basically told me who they were with each revision. You referenced the movie Lucy in a Diversity in YA post. For me, Want felt like the anti-Lucy, and that’s something we need way more of. What do you hope to see in the future in terms of Asian representation in media? I want movies and shows and media in the west to feature Asians front and center as protagonists and heroes, in all genres, from comedy to drama to speculative fiction. We’ve been shunted aside for far too long as far as representation, and so often, the bits we are given are offensive or stereotypical or completely dispensible. All the whitewashing is becoming tired and ridiculous. Our erasure still in media is very real. The moment I finished reading Want, I wanted (haha) more. I hear there’s a sequel happening. Can you tell us anything about it? Yes! My fantastic editor offered on RUSE, the WANT sequel, while I was actually in Shanghai for a research trip. So I am hoping to set RUSE in Shanghai. My second books are always dealing with the consequences of what happened in the first novel, and that is what I want to focus on in this one, too. Won’t say much more than that. ha! Want is definitely going on the top of my list of fave Asian YA reads. What are some of yours? Aww, that is such a compliment coming from you. Thank you so much, Jessica! I really love Malinda Lo’s Huntress and her forthcoming thriller A Line in the Dark. I also loved The Reader by Traci Chee, Rebel Seoul by Axie Oh, ENTER TITLE HERE by Rahul Kanakia, and Julie Dao’s Forest of a Thousand Lanterns! So much more to choose from since my Silver Phoenix debut back in 2009! I imagine people have asked you what your favorite Taiwanese food is. But what I want to know is… What’s your favorite pearl milk tea flavor? hahaha! Coconut milk tea OR barley tea (no milk)! Finally, what new YA books are on your to-read list this year? I’m super excited to read The Epic Crush of Genie Lo by F. C. Yee, Wild Beauty by Anna-Marie McLemore, The Library of Fates by Aditi Khorana, Warcross by Marie Lu, Uncanny by David Mcinnis Gill, The Glass Spare by Lauren Destefano, and The Speaker by Traci Chee! Thanks for stopping by! For those of you reading along, be sure to grab Want for your must-read shelf! You can find Cindy on Twitter and on her website! Congratulations, Cindy! 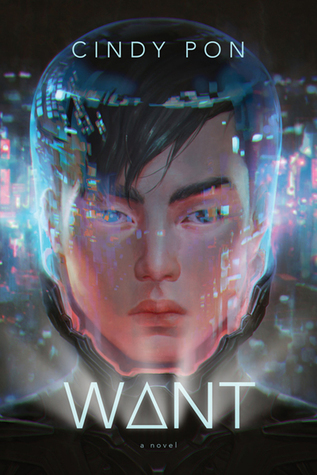 I look forward to reading WANT–and now its sequel!